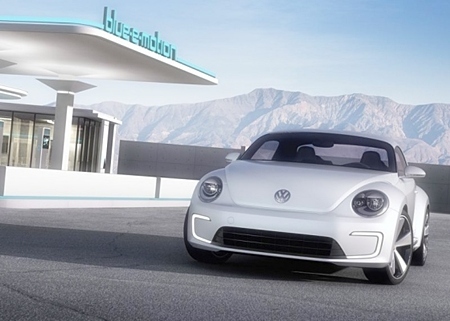 Volkswagen has unveiled its two-seater E-Bugster concept also at the North American International Auto Show in Detroit. Being an “e” (electric vehicle), it has an 85 kW electric motor which can see the E-Bugster from 0 to 100 km/h in a fairly leisurely 11 seconds. However, the 28.3 kWh battery is good for an impressive range of at least 177 km while it also claims that the battery can be completely recharged in a mere 35 minutes. The kinetic energy recover system (KERS) charges the battery whenever the driver steps off the accelerator (provided the car’s in motion), and more when under braking. This fast-charge capability comes courtesy of the Combined Charging System which makes possible charging from single-phase AC sources (i.e. your domestic mains), provided an industry standard for plugs and sockets can be nailed down. “Ultra-fast” charging would be possible at dedicated DC charging stations. The E-Bugster is the same length as the standard Beetle, but with a width of 1,838 mm it is some 30 mm wider. It is also 90 mm lower than a standard Beetle, standing at 1,400 mm high. When the driver presses the Start button the interior is bathed in white light, then blue light. It starts with a light pulse in the instrument cluster, from where the light emanates in a millimeter-wide strip, coursing into the doors and around the air nozzles. LED running lights surround the central air intake at the front of the E-Bugster, with reflectors doing the job to the rear. Twenty inch alloy wheels as opposed to the 18 inch alloys of the Beetle. However, remember that this vehicle, like the Toyota NS4 remains a concept. Will we see an electric Beetle? Simple answer is “Yes”, but not yet. Next articleAre you ready for a PIH? Excuse me, have you seen an E85 pump round here?